I've had the beds of two Colchester Students, and my present Colchester Master 2500 slideway ground over the years, then had the saddles Turcited and ground, with minimal scraping to finish the job. And I spoilt myself on the current lathe and had all the cosmetic surfaces ground as well. No doubt the purists will howl me down but it seems a much better way of resurfacing a machine if a big enough slideway grinder is available. Steve, after the welding have you normalised the assembly, heat cycle or whatever. If not is it not going to carry on moving for weeks? Yes my thoughts exactly. Without heat treating to de-stress the welds you are wasting your time scraping. Even the machining will change the stress pattern and cause the whole job to move. Andrew, grinding is the only method that can be used on lathes with induction hardened ways. The Harrison models like mine,Mick's and John's all have induction hardened beds,is that thecase with the Colchester Master?....OZ. Most of us are wasting our time, Bill, and everything moves. Have you actually built and measured a bolted lathe bed of these dimensions and materials, with these size welds, peened and sequenced this way, so you can actually say what will happen? I haven't, and I'm willing to find out, and doing that isn't a waste of my time. Before you tell me what to do with my time, please mike everyone on this forum's lathes and let me know what you find for an average tolerance. Then let me know when mine will warp past that point so I can switch it off in time. Bill, when a guy is deeply involved in a project, the advice that what he's doing is a waste of time will likely not set well. No sure if you mentioned it earlier ,but will you be adding another length of material to the top of the scraped areas to form the ways ? or do you have some other cunning plan ? Just looking at the bed , if two flats were added on top of the scrapped flats to form a "T" shape it would be just like my Myford lathe bed . Yes, Rob, there are two pieces that go on top of the bed for the actual lathe ways. I've only been scraping their bedding here. The Gingery lathe was built the same way, though it was a single continuous piece on top, full width. The bed is first scraped and then the ways bolted down. The present bed is through bolted together with 1/2" grade 5 bolts. 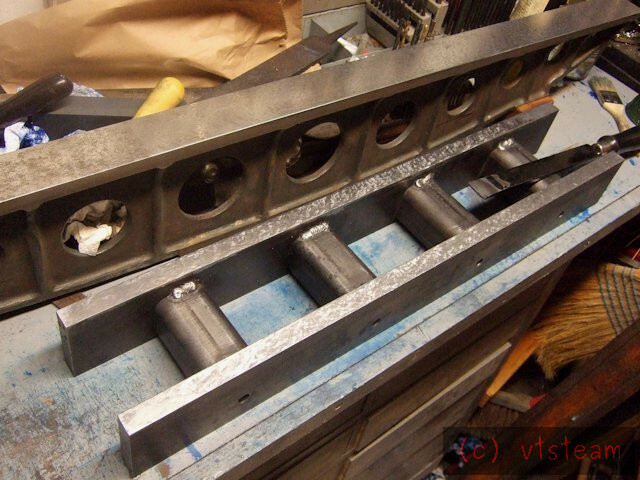 The square section tube is heavy wall -- .25" and all members were milled and filed square and within one thou of each other in lenghth. There was no daylight when bolted and there is none now. The rails are hot rolled steel. The lathe bed was welded while bolted. The welds are only 1" long, and only located on top and bottom of the tubes, they were sequence welded and peened while cooling similar to cast iron welding practice to perform stress relief. Their function is to keep the cross members from shifting. The bolts and rails are the real structural connections. Both the top and bottom of the 3/4" thick rails of the bed were milled as an assembly prior to scraping. So the bed will be very similar to my old Myford lathe Steve . Similar to my Craftsman, too, Rob (and that micron tolerance lathe). The Craftsman has another feature I'll be borrowing, but we'll keep people guessing on that one til it's time to make it. Remember, early on I said this was going to be a combination of things I'd learned from both my lathes. How are you going to fit the ways to the side rails? I used to think that a lot of things that people did were a waste of time but these days I'll send hours making or repairing something that would have been cheaper to buy and when people ask why my normal reply is "Because I can"
Phil, I'm going to set them upside down on the surface plate, epoxy as a bedding compound, let that kick overnight, and then drill and tap for countrsunk screws. That will keep things from shifting while trying to drill and tap, ensure eveness of the ways, won't depend on the epoxy except as a perfectly fitting bed, prevent the glue pressure from bowing the ways if it was screwed down while the epoxy was wet, prevent misalignment of the screw holes from bowing the ways, and probably a lot of other reasons I could think up. If screw down in a day, the epoxy won't be absolutely rock hard (full cure takes a month for most epoxies) but will resist deformation at the screw pressure vs contact area not to depress the ways, yet there will be some tension in the screw holding the way to the bed. At least that's my theory! Been thinking about making those screws, too. Mild steel rod, the size of the head, turn the countersink shape and thread. Kind of like a flathead screw still attached to the rod it was made from. Cut it off so it has a 1" long rod head. If I screw that into a countersing hole with a wrench, I can then cut it off flush with a hacksaw while it's in place, file it down, then scrape. Very similar to plugging screw holes when I was a boatbuilder, only the screw has its own plug built in. I'm enjoying reading this thread, and taking notes too for when I eventually get around to building a lathe. I'm not sure that I will ever build a lathe, but I sure am enjoying following along. I'm enjoying it too, great read. It looks pretty good this morning -- the gap varies by only .004" over the full length, and the outside way width by .003" total. Within light scraping tolerances, so I hope to get through that process without a marathon of blue. Real happy with this construction so far. With the electric heater and heat lamp on, shop and lathe bed stayed warm overnight, Good thing since we dropped down to -13C last night. Was waiting to see how everything turned out. It is starting to look unmistakeably like a lathe bed. Quite nice. How much do anticipate this thing to weigh? Really exited to see how do mount the headstock. I'm sure there is plan (sound effects here). 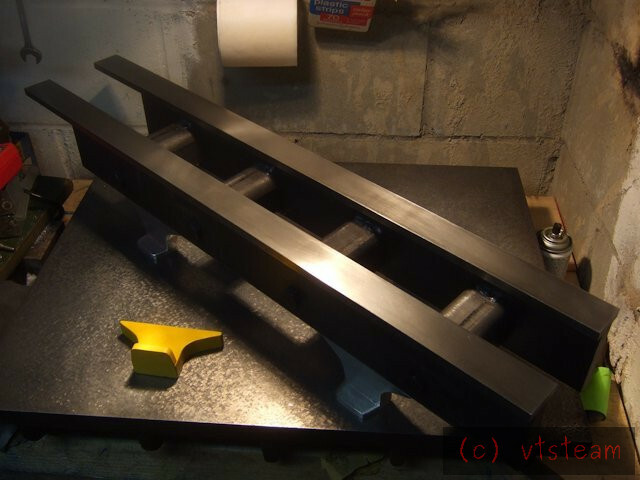 The bed now weighs exactly 50 pounds (22 kilos) and the headstock will be built with slides and gib and gib screws, just like the tailstock, so it can be bored while traveling along the ways. This makes the spindle bore parallel to the ways. Then it is bolted in position. This also means that if the headstock ever needs to be removed, it can be replaced in proper bed orientation, as long as the gibs are tightened, without need for measurement. The slides in the headstock do not wear, nor do the ways where it is normally positioned. Steve,you're doing a superb job on this. Good job on the alignment,hopefully that will reward you with a lot less scraping to get it all spot on. As with most challenges it is the mindset that really counts,and what I see with this and many of your other projects is that you are a guy who applies himself to the project and problems really well. Great job,keep it up. .......OZ.